The following three (3) Local Councils are participating in Healthy Neighborhoods: Wilmington/Claymont, Kent/Smyrna, and Sussex County Health Coalition (SCHC). The Wilmington/Claymont has two task forces called Maternal and Child Health AND Behavioral Health. Kent/Smyrna Council has two task forces called Behavioral health and Lifestyles/Chronic Disease. Sussex County Health Coalition has two task forces called Behavioral health and Lifestyles/Chronic Disease. 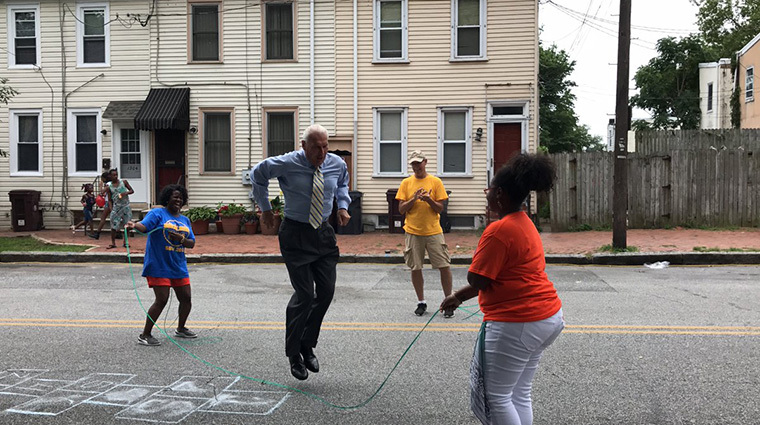 “Play Streets” is an initiative that was the result of research conducted by the Delaware Center of Health Innovation’s Healthy Neighborhoods Healthy Lifestyles and Chronic Disease Task Force. Their objective was to learn about activities or events that could help stimulate physical activity and potentially lower obesity rates in areas where there were limited opportunities to get out and get active. Play Streets is launching in Wilmington this summer, thanks to funding by Christiana Care Health System, under the Wilmington Parks and Recreation umbrella. Beginning in early June, a total of 32 Play Streets neighborhood events will take place throughout the summer in eight different neighborhoods. Rysheema Dixon, of RD Innovative Planning, is the consultant working with Christiana Care to manage the events. She gave a bit of the history: “Play Streets is an activity modeled after others that have been successful in Philadelphia, Baton Route, New York, and Chicago.” She explained that the goal is to “Increase physical activity among children but also create a safe environment for kids to play and the community to get together.” The blocks in Wilmington were chosen because of need — those that had been hit by crime or violence. The Wilmington/Claymont Behavioral Health Task Force is developing an internship program for Peer Specialists— individuals who have lived an experience with mental illness, addiction, co-occurring conditions, and recovery. Peers who have been trained to help link individuals with behavioral health needs to appropriate services and supports, become certified in this profession. They hope to create more Certified Peer Specialists through the internship program and remove barriers that currently exist for those who would like to become certified. A similar model is being used by the Behavioral Health Task Force to tackle domestic violence — referring victims to resources beyond those that are medical and clinical. The goal is to use the Peer Specialist and Community Health Worker model to connect victims of domestic violence with other services they may need for their children and themselves. Peer Specialists are also getting additional training to identify domestic violence victims in a different way. The Healthy Lifestyles and Chronic Diseases Task Force is partnering with the National Council on Agricultural Life and Labor Research Fund Inc. (NCALL) to implement “Open Streets.” By closing streets to cars, they become places where people of all ages, abilities, and backgrounds can improve their health, by using public streets for recreation and active living. The launch of Open Streets took place in Dover on Saturday, April 21, where nearly 200 people participated. NCALL is implementing six Open Streets events from April through October 2018. The next event is scheduled to take place on June 30th from 10am to 2pm in Dover. The idea for Open Streets was piloted successfully in Wilmington last year and the Task Force plans to expand these events to Smyrna starting in the Fall. The Behavioral Health Task Force is partnering with Dover Interfaith Mission for Housing (DIMH) to implement an engagement initiative for homeless individuals using Community Health Workers (CHW) and lockers. Through this proven proposed initiative, DIMH will work to expand and enhance access to services and support for homeless individuals living with behavioral health conditions in our community, by offering access to a locker in exchange for engagement in a one-on-one consultation with the DIMH CHW, with the goal of developing a person-centered action plan. As a part of their role, DIMH’s CHW will work to strengthen collaborations with community partners through behavioral health 101 training, as well as the development of a Resource Guide that will be made available to those who serve this population. The Dover/Smyrna Behavioral Health Task Force is also working with several local providers to support access to care for individuals and families who are experiencing domestic violence through a Community Health Worker and High Risk Advocate, as well as implement a pilot project that will bring together first responders (e.g., police, hospitals, etc.) and treatment providers on behalf of individuals who are experiencing acute behavioral health crises and their families. The Sussex County Health Coalition (SCHC) announced its timeline to launch a robust Drug Free Awareness Campaign — “Seaford Goes Purple” — at its Quarterly Meeting in April. The campaign will officially launch at two events in September: A community event on the 11th, followed by a school-based launch event on the 12th. The campaign is working in conjunction with the Chris Herren Project, an organization dedicated to substance abuse education and public awareness. Steered by the Drug Free Community Committee, the campaign hopes to join forces with Southern Maryland’s existing awareness campaign for a regional, community-driven initiative. To maximize the impact of this campaign, funded in part by Highmark Blueprint for the community, SCHC is developing a proposal to implement expanded school-based prevention strategies, utilizing Botvin Life Skills Curriculum for students in the Seaford School District. Additional campaign initiatives will address how to help those in need, advocate for increased and better service arrays and support families devasted by this disease. Additionally, SCHC is proposing a mental health access initiative, couched in an integrated care model, for youth with mental health needs. This project, modeled in Sussex County initially by a pilot group of school districts and initially funded through Highmark, will be expanded to greatly increase mental health access in schools and decrease wait time and barriers to care.